Uninstalling Software with Powershell. | Chinny Chukwudozie, Cloud Solutions. ← Resolving EventID: 4292 IPSec driver Block mode Error !! 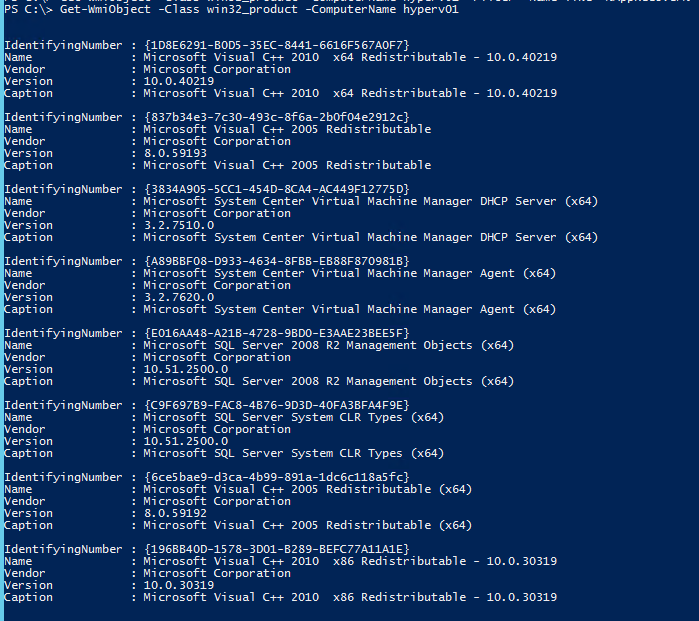 I have a number of Hyper-v Windows Server 2012 R2 core host machines in my environment. Once in a while, I have to check for installed software and uninstall software for maintenance. 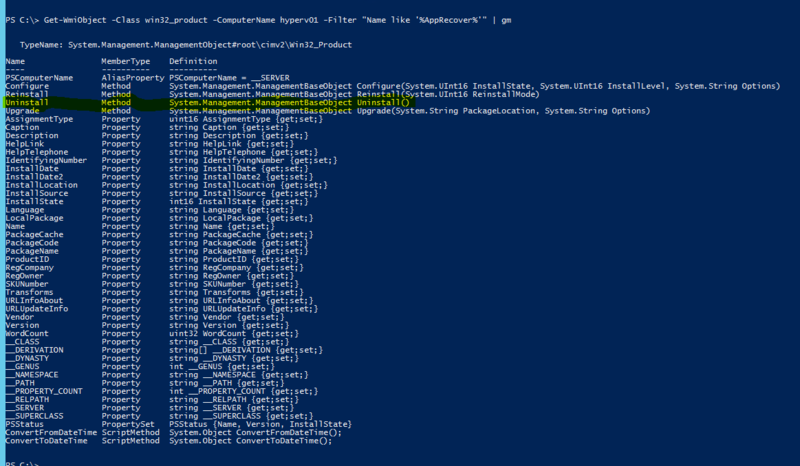 The following WMIObject class helped me achieve the task in PowerShell. The uninstall task starts to run and immediately restarts the remote server in question to complete the uninstallation. Usually, the return value should be 0 (zero). But in this case, the msi installer triggered an automatic restart to complete the uninstallation.Checking for installed software after the restart, shows the AppRecovery software has been removed. I’ve also encountered a situation where the software uninstallation failed because User Account Control was enabled as indicated below. In such a scenario, I ran Powershell in Administrator mode before successfully uninstalling the software. PS C:\> Get-WmiObject -Class win32_product -ComputerName hvs00 -Filter "Name like '%symantec%'"
PS C:\> $b = Get-WmiObject -Class win32_product -ComputerName hvs00 -Filter "Name like '%symantec%'"
Removal was successful this time, with ReturnValue set at 0. 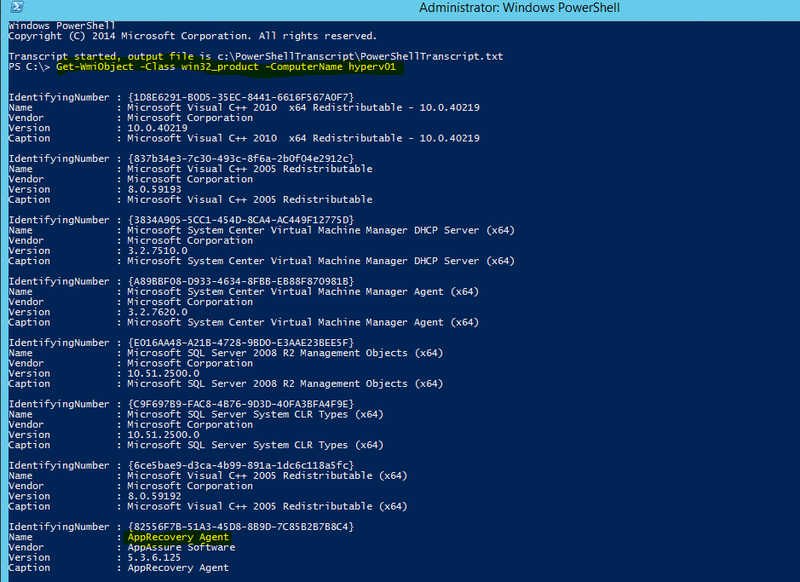 This entry was posted in Hyper-v, Hyper-v 2012 R2, Microsoft Hyper-v, PowerShell, PowerShell 3.0, Powershell 4.0, Windows Server 2008 R2 Backup, Windows Server 2012, Windows Server 2012 R2 and tagged Powershell 3.0, Windows PowerShell, WMIObject. Bookmark the permalink. 3 Responses to Uninstalling Software with Powershell.